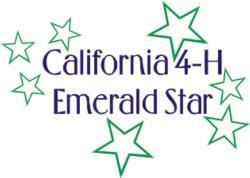 The Orange County 4-H Emerald Star program is designed for senior 4-H members 14 years of age or older as of December 31 of the current program year. 1. Improving, creating, and expanding 4-H programs through project work beyond the individual club level. 2. Helping grow and improve abilities of youth in areas of project planning, organization, leadership, and presentation. 3. Providing another opportunity for 4-H members to develop and apply leadership and planning skills required to apply for an All Star County Ambassador position. Typically, youth develop an action plan for a multi-club project and then organize and facilitate this project. After completion and presentation of their project, they are awarded with the 4-H Emerald Star ranking. Interested in pursuing an Emerald Star project? Find helpful resources to guide you here. Find Emerald Star Guidelines and Application form here.